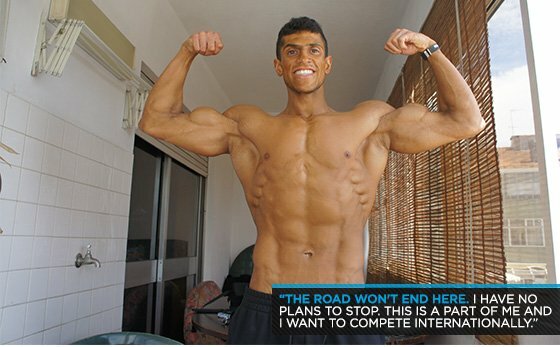 Amateur Bodybuilder Of The Week: Pumping Iron In Portugal! Luis invested his energy into serious goals and left adolescent activities for the boys. The results put him in a class that only allows shredded physiques! I started bodybuilding at age 16 after watching the Mr. Olympia. I was inspired and started going to the gym every day without missing a workout. It became my passion when I saw progress and my body changed. At that time, I was overweight (90 kg/200 lbs) and my objective was to lose fat. I changed my eating habits and lifestyle, which was hard because everyone only cared about partying and didn't understand why I did it. I evolved inside the gym room and never gave up no matter what obstacles crossed my way. After the major weight loss, I started lean bulking to gain mass. Last year, I started to collect the payoff of my hard work and was invited to join a bodybuilding team. That's when the road started and I prepared for my first competition. My first competition was on May 1, 2013, in Portugal. I took second at the regional qualifier in the classic bodybuilding category and qualified for nationals. 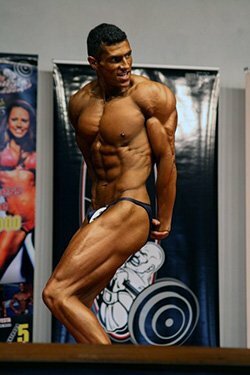 Four days later, I took third place in the classic bodybuilding category at nationals. The road won't end here. I have no plans to stop. This is a part of me and I want to compete internationally. I like hard and intense workouts that last a maximum of 45-60 minutes. In the off-season, I do a mix of strength and hypertrophy training with heavy loads and perfect form. If I prepare for a contest, I reduce the load and increase the reps and intensity. Here's a sample of my cutting diet. Bodybuilding won't yield immediate results. You have to fight hard for every ounce of lean mass. It's a full-time job, but one I enjoy. I constantly set new goals for myself and hope to surpass them and get better and stronger physically and mentally. I'm the shaper of my body. Being a bodybuilder is a dream that I've had since I set foot in the gym for the first time. I'm completely fascinated by the entire sport. I'm going to go as far as possible and perhaps be known worldwide one day. I started going to the gym with a friend who had some experience. He taught me the basics regarding training and nutrition, which I believe is the most important aspect to be a successful bodybuilder. I will be in offseason until 2014 to gain as much lean mass as possible. My next goal is to compete in 2014 at the Portugal Bodybuilding Cup and get to a level where I compete internationally. There is much information floating around. I advise people to read, study and make their own conclusions based on their results. We're not all made equal. The bodybuilder I most admire is Jay Cutler. I like his approach and training methods, his personality, and above all, his perseverance. Two years ago, he ruptured his biceps and didn't give up competing in the Olympia. I recently started using BodySpace and spoke to a few people and exchanged opinions. It's a good place to learn different approaches to dieting, exercise, supplementation, etc.